I’m an especially proud tennis coach today. Denver Montclair International School’s inaugural tennis team technically started last fall, when most of the 6th graders you see in this picture weren’t sure how to hold a tennis racquet or where the service line even was. Yesterday, they posed for this photo after winning yet another team match (this time, 2 matches to 1). As a team, they’re actually undefeated so far this season. Amazing! The two players who really stood out to me yesterday were actually the two players who lost their match. See the girls kneeling with the racquets in front of them? I’m talking about those two. 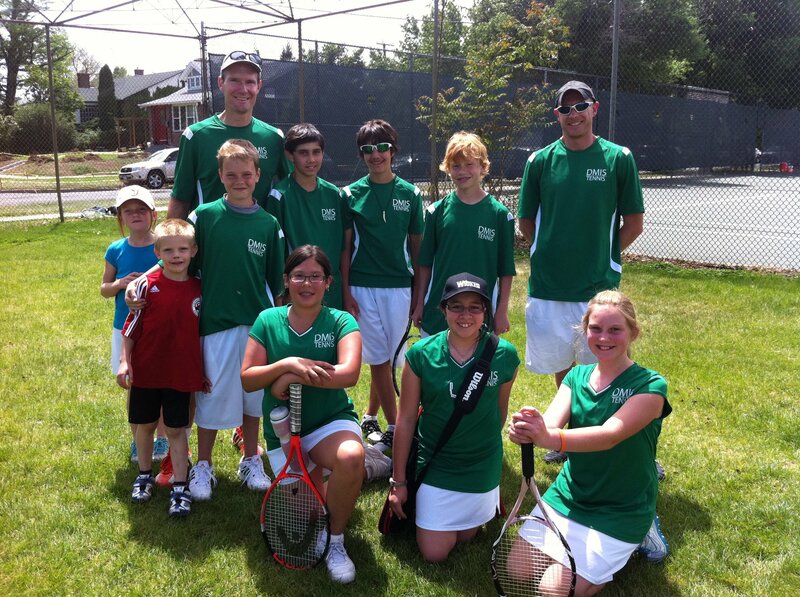 They played a mixed-doubles team that included an 8th grade boy who is about as tall as I am. The girls lost the first set, but they were not intimidated. I could see them whispering strategy. They won the second set. Then they held their own throughout the third set, losing the set tie breaker 7-4. They played smartly and calmly throughout. They were great sports. They were great team players. A cool side note: The man standing in the hat and glasses at the top right of this photo is Chip Hudson, co-owner of HD Software, maker of the My Tennis Stats application that works on the iPhone, iPad and iPod Touch. My Tennis Stats generously sponsored DMIS’ middle-school tennis team. This is a great application that tracks hundreds of tennis statistics so you can improve your game by tracking your every move — and tracking every move of your opponents.